Our body consists of numerous hair follicles out of which hair grows. These tiny pockets can get infected, causing them to swell up and turn into painful pus-filled, red bumps. The medical term for this condition is folliculitis. An infection in hair follicles can result from acne, friction during shaving, friction from wearing clothes that are too tight, using makeup, a reaction to certain medications and other causes. The condition is benign and can be taken care of using natural home remedies. One much-coveted natural ingredient that has proven to be effective is turmeric. (3) This bright yellow and earthy-flavored spice contains curcumin, a powerful active component that imparts anti-inflammatory and antimicrobial properties to turmeric. It is for this reason that turmeric has been a part of ancient medicine for treating a number of ailments. Even in the beauty world, turmeric has been used for lightening the skin’s complexion and is a common component in skin-brightening masks. For folliculitis, turmeric can be used both internally and externally to kill the bacterial or fungal growth in the hair follicles. Its anti-inflammatory properties also help bring down the swelling and redness. The only drawback with topical application is the strong yellow stain that it leaves on your skin, but it will fade away in a day or two. 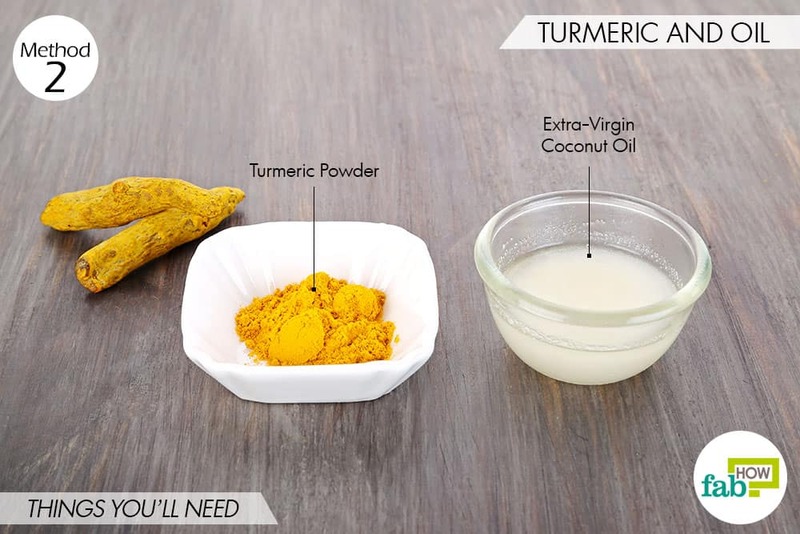 Here are nine ways you can use the powerful turmeric for folliculitis. Caution: Do not consume turmeric if you are diabetic, suffering from gallbladder disease, taking blood thinners or if you are pregnant. The easiest and quickest way to use turmeric for folliculitis is by consuming turmeric capsules. 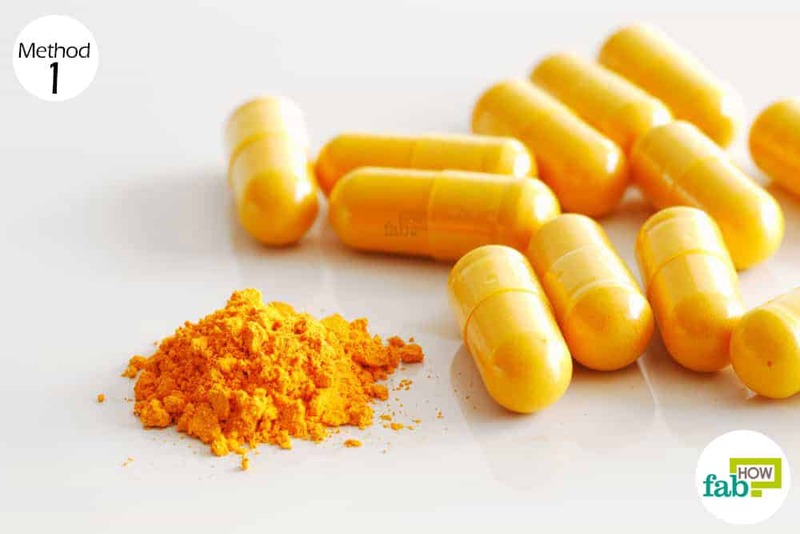 Turmeric supplements can easily be found in a health store near you. You need to consume at least 2 teaspoons daily for a couple of days to get effective results. Generally, 4 capsules of turmeric equal 1 teaspoon, so take the number of capsules accordingly. Consume 2 to 4 capsules of turmeric twice daily for 1 week to get relief from folliculitis. Also, drink a glass of water along with the capsules to avoid constipation. 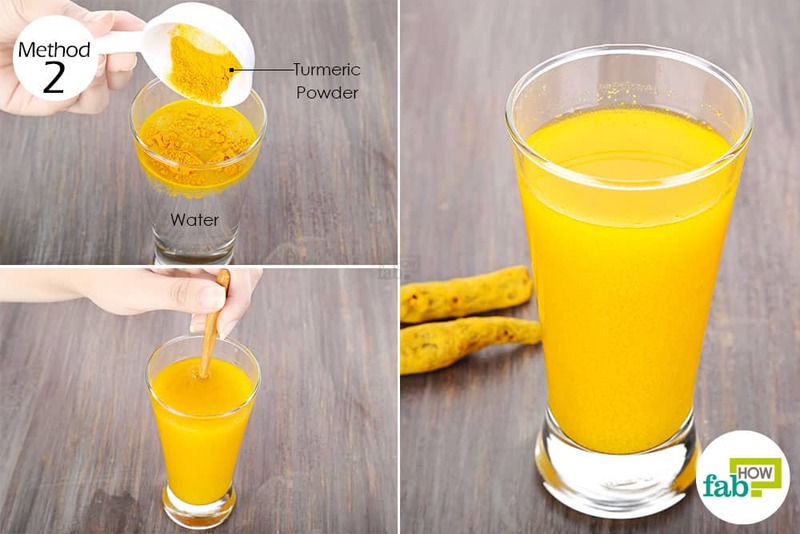 You can consume turmeric by simply dissolving it in water. It will also ensure that you drink enough water along with the turmeric to prevent any chance of constipation. If you don’t like the taste, you can mix the turmeric into orange or prune juice instead of water. 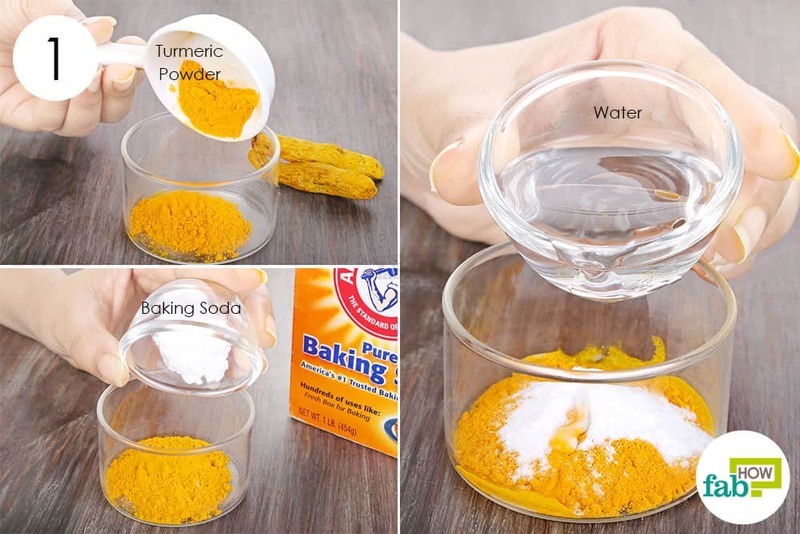 Add 1 teaspoon of turmeric powder to 1 glass of water. Stir well until the turmeric dissolves. Consume this drink twice daily to treat folliculitis within 1 week. Consuming turmeric with milk can help it absorb better in your body to heal folliculitis from within. Also, this makes for a tastier drink to consume on a daily basis. You can use any milk of your choice for this remedy. 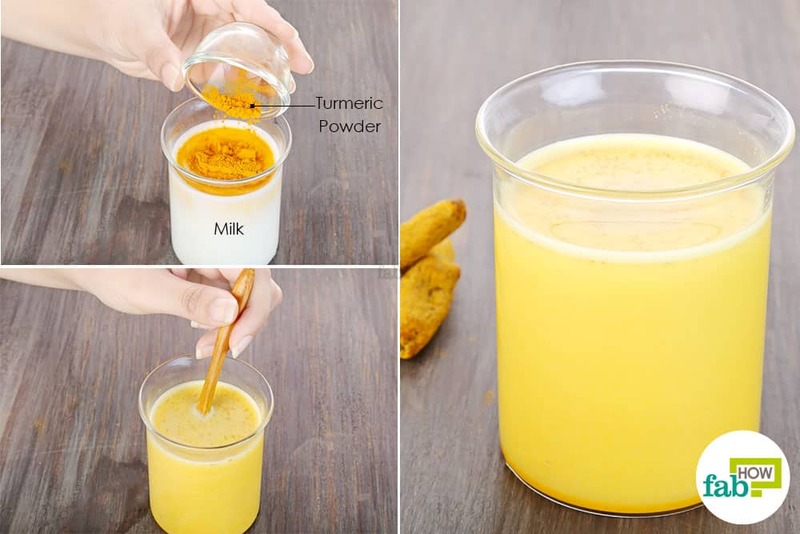 Add 1 teaspoon of organic turmeric powder to a glass of warm milk. 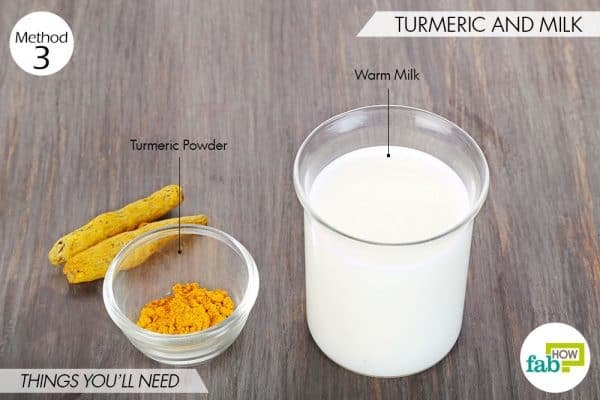 Consume the turmeric milk twice daily for 1 week to treat folliculitis. Drinking turmeric milk at bedtime will also ensure a good night sleep. You can increase the effectiveness of turmeric a great deal by adding some black pepper to it. Black pepper contains an active compound called piperine that increases the bioavailability of curcumin. 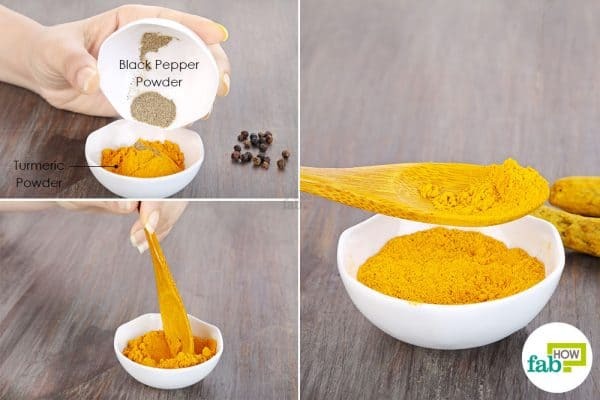 Mix 1 tablespoon of turmeric powder and 1 teaspoon of black pepper powder in a small container. Consume 1 teaspoon of this mixture 3 times a day. Continue using this remedy for 1 week or until your folliculitis is completely gone. 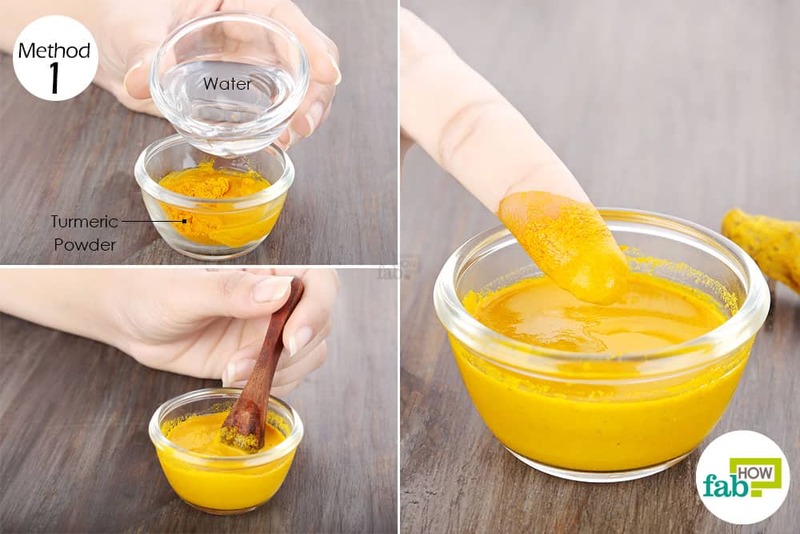 A simple way to use turmeric topically is to mix it with water to form a paste that you can apply to your skin. 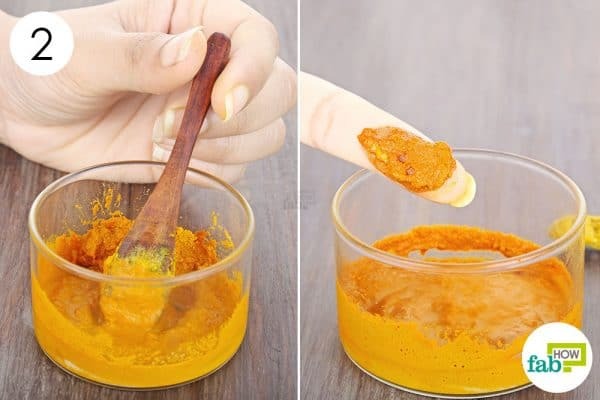 Mix 2 teaspoons of turmeric powder with enough warm water to form a thick yet spreadable paste. Using a clean finger, apply a thick layer of the paste to the infected skin. Let it sit for 20 minutes or until the paste dries completely. Repeat this remedy once daily for 1 to 2 weeks to treat folliculitis. Turmeric can also be combined with coconut oil to make an effective remedy for folliculitis. In addition to the potent turmeric, coconut oil has its own antimicrobial and anti-inflammatory properties that help kill the bacteria. Its rich, fatty content also helps soothe itching in the red bumps and nourishes the skin for faster and healthier skin renewal. Mix ½ a teaspoon of turmeric powder and 1 teaspoon of coconut oil to form a lump-free paste. Preferably, use extra-virgin oil as it contains the maximum amount of nutrients. Apply the paste to the infected skin and leave it on for 2 hours. Apply this turmeric-oil blend once daily to treat your folliculitis. It should go away in 1 to 2 weeks, depending on the severity of the infection. A mix of turmeric and apple cider vinegar can also bring immense relief from folliculitis. Apple cider vinegar is a strong antibacterial that can pull the bacteria out of the infected follicles, while turmeric soothes the inflammation. Apple cider vinegar also brings the pH of the skin back to normal to prevent acne or further infections. 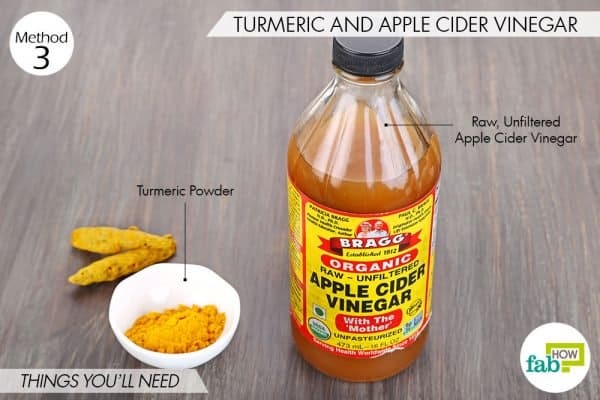 Use undiluted, raw apple cider vinegar for this remedy, as it contains the maximum enzymes. Note: Apple cider vinegar can sting a bit, but the burning will subside in a minute. However, if the burning is unbearable, wash off the paste immediately and try the other ways to use turmeric for folliculitis. 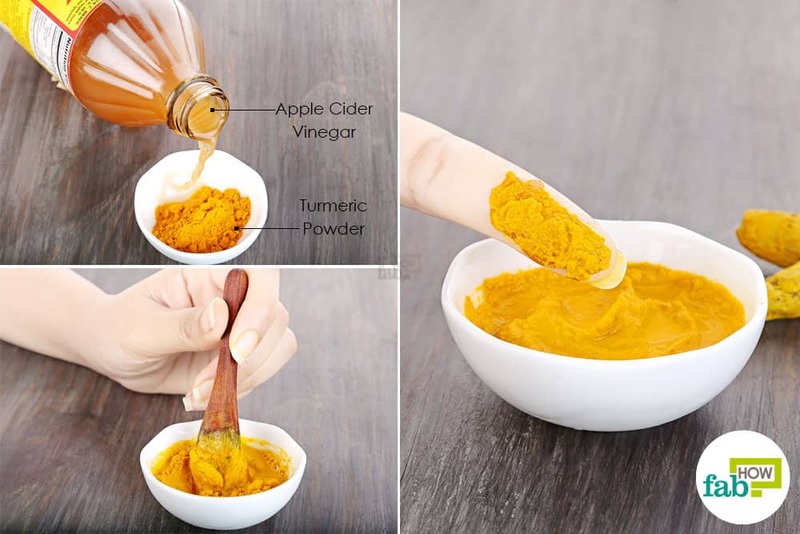 Mix 1 teaspoon of turmeric powder with enough apple cider vinegar to form a thick yet runny paste. 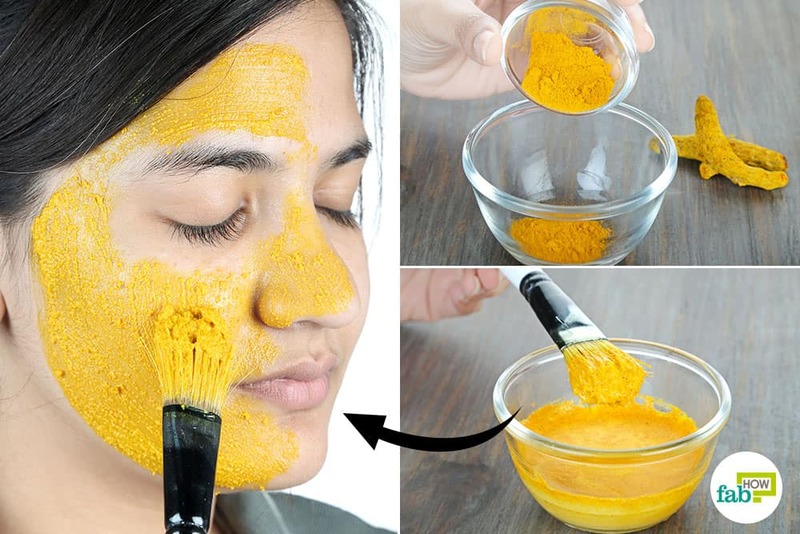 If your skin is sensitive, you can dilute the vinegar first with water and then add it to the turmeric powder. Apply an even layer of the paste to the infected skin. Let it sit until the paste dries completely, then rinse it off with plain water and pat dry your skin. You can apply some coconut oil afterward if your skin feels too dry. Use this remedy once daily for at least 1 week to see visible improvement in the bumps. Continue using it until your skin is completely healed. 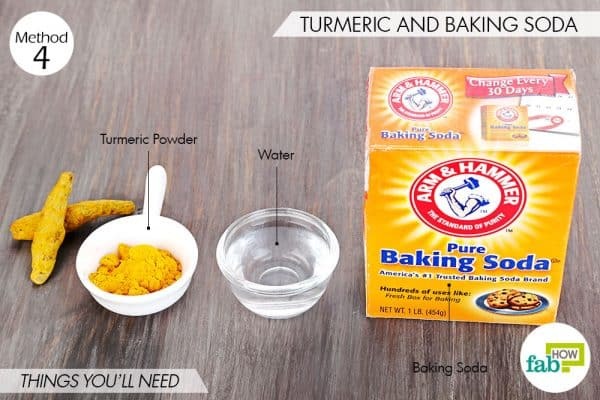 Combining turmeric with baking soda serves well as a natural remedy for folliculitis. Baking soda works as a disinfectant, killing the bacteria embedded in the hair follicles and soothing the itching. Turmeric also helps eliminate the bacteria and reduce the swelling in the infected follicles. In addition, baking soda helps neutralize the pH level of your skin for faster healing. Put 2 teaspoons of turmeric powder in a container. Add 1 teaspoon of baking soda to the turmeric. Pour in enough water to make a thick paste. Mix the ingredients to form a consistent paste. 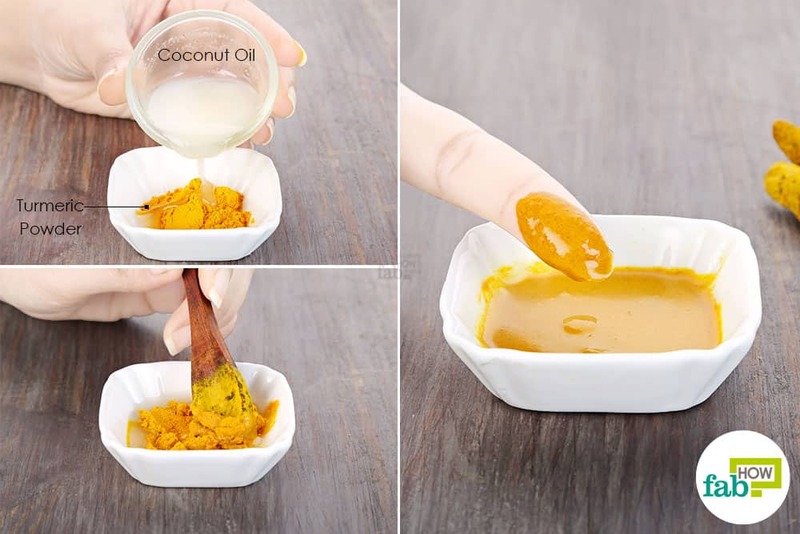 Take some of the paste on a clean finger and apply it to the infected areas of your skin. Let it sit for 10 to 15 minutes, then rinse your skin with plain water. Repeat this home remedy once daily for 1 to 2 weeks to get relief from folliculitis. Last but not least, a paste of aloe vera and turmeric can help cool off the skin affected by folliculitis. Aloe vera is rich in essential vitamins and minerals that help renew the skin quickly. 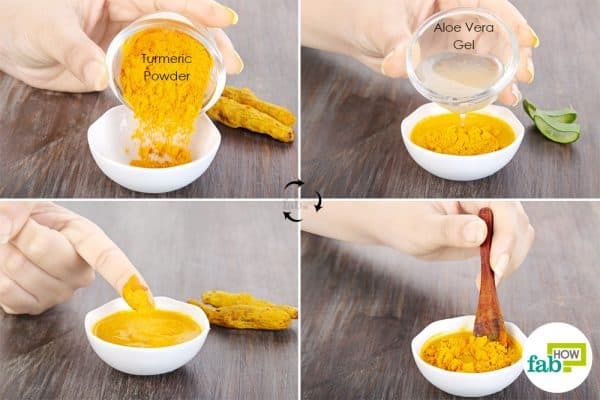 Like turmeric, the gel also has antibacterial and anti-inflammatory properties that will curb the growth of bacteria and also soothe inflammation. Freshly extracted aloe vera gel works the best in this remedy. You can learn how to easily extract your own aloe vera gel if you have an aloe plant. 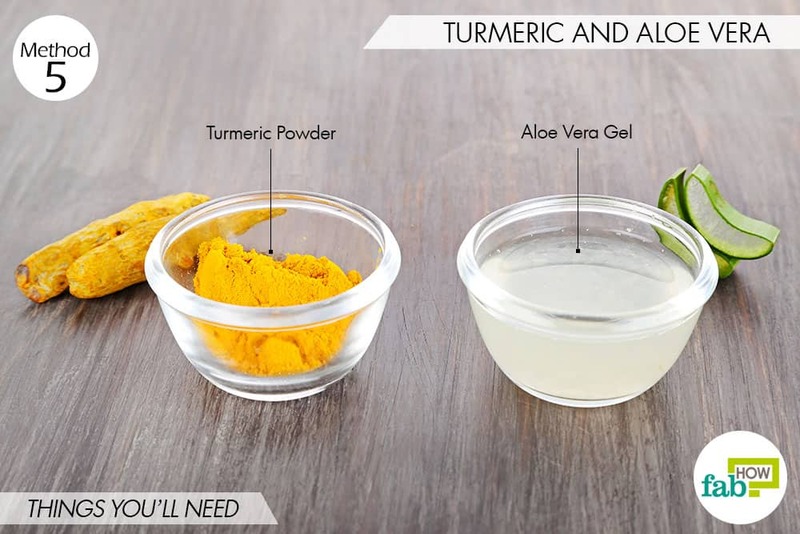 Mix 1 teaspoon of turmeric powder and 1 tablespoon of freshly extracted aloe vera gel in a bowl. Apply the blend to the infected bumps. Let it sit for 15 to 20 minutes, then rinse your skin with water and pat it dry. Apply it once daily for 2 weeks to treat folliculitis. 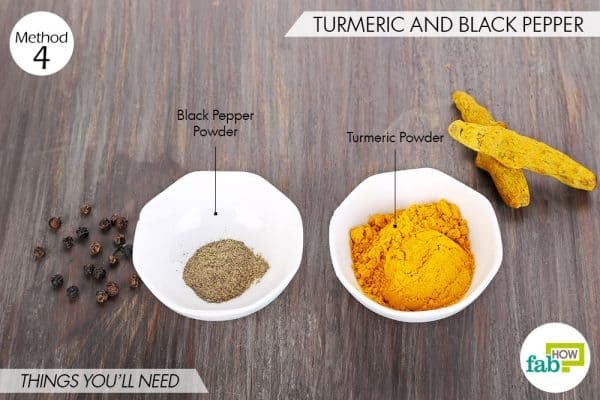 Since turmeric can leave a nasty stain on your clothes, wear an old tee when applying any of the turmeric blends. If needed, there are many effective ways to get a turmeric stain out of fabric. While turmeric does not typically cause any reaction on the skin, if you experience any discomfort, wash off the paste immediately. When consuming turmeric, you may experience a slight stomachache. Drinking plenty of water will help you avoid an upset stomach. If it hurts too much, stop the consumption and visit your doctor for a thorough checkup. 1. Tyagi P, Singh M, Kumari H, Kumari A, Mukhopadhyay K. Bactericidal Activity of Curcumin I Is Associated. PLOS ONE. https://www.ncbi.nlm.nih.gov/pmc/articles/PMC4374920/. Published 2015. 2. Shoba G, Joy D, Joseph T, Majeed M, Rajendran R, Srinivas PS. Influence of piperine on the pharmacokinetics of curcumin in animals and human volunteers. Planta Medica. https://www.ncbi.nlm.nih.gov/pubmed/9619120. Published 1998. 3. Nguyen TA, Friedman AJ. 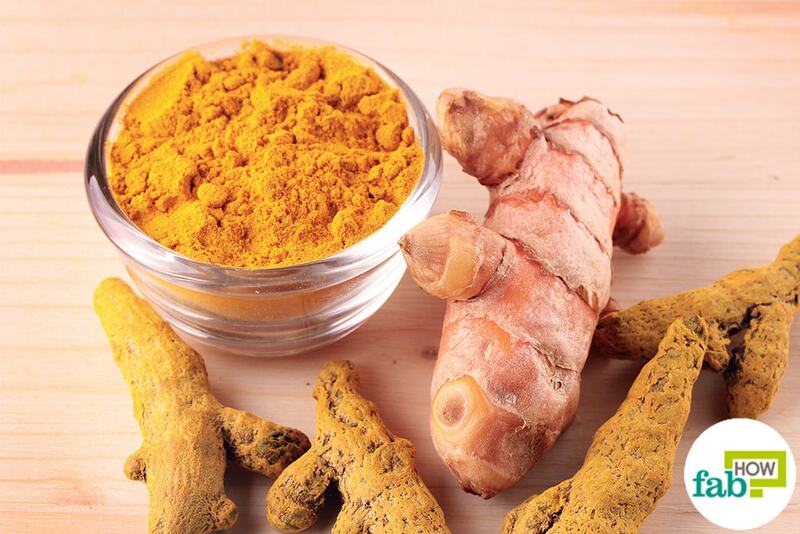 Curcumin: A Novel Treatment for Skin-Related Disorders. JDDonline. http://jddonline.com/articles/dermatology/S1545961613P1131X/1. Published October 2013.